If you suffer from drooping upper eyelids or puffy undereye bags, a laser blepharoplasty can be a great alternative to a traditional eye-lift. This procedure makes it possible to safely (and with a quick recovery) correct sagging eyelids, excessive skin, and bulging fat pads around the eyes. In some cases, excessive skin and fat around the eyes can be so severe that it becomes difficult for an individual to see. 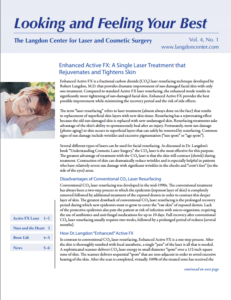 At The Langdon Center for Laser & Cosmetic Surgery in Guilford, CT, board certified cosmetic surgeon Robert Langdon, MD uses a CO2 laser instead of a surgical scalpel for blepharoplasty. The CO2 laser creates an incision while simultaneously coagulating small blood vessels, which significantly reduces bruising and swelling and reduces recovery time. 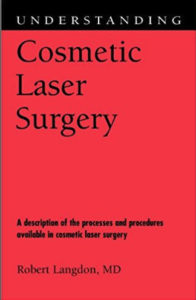 Because the laser offers a clean and heated cut, there’s minimal swelling and bruising associated with the treatment. Patients should expect minor post-operative discomfort, which can be relieved with ice packs and cold compresses. This discomfort usually fades within one day. Patients should focus on resting and recovering the first two days after the procedure. Normal activities can be resumed two to four days after the treatment although vigorous activity and heavy lifting should be avoided for two weeks. There may be minor scarring on the upper eyelids. This scar line is very minimal and barely noticeable. There is never a scar on the lower eyelid because Dr. Langdon always uses a trans-conjunctival incision (through the inner surface of the lower lid). After laser blepharoplasty patients can expect a vibrant, youthful appearance around their eyes and a more alert and rested appearance. In severe cases of eyelid drooping the visual field will be improved; health insurance coverage may cover some or all of the cost of the procedure in these cases. To learn more about how you can eliminate the appearance of sagging eyelids and fat bags under your eyes, schedule a laser blepharoplasty consultation with board-certified cosmetic surgeon Dr. Robert Langdon at The Langdon Center for Laser & Cosmetic Surgery in Guilford, CT today! Call 203-745-0340 to learn more.